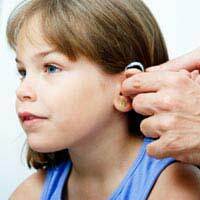 What Types of Congenital Hearing Problems Are There? Home > Children & Ear Health > What Types of Congenital Hearing Problems Are There? Congenital hearing problems are those that are present in a baby right from the time that it is born. They develop either due to a genetic factor that is passed on from one parent to the child, or they are due to trauma or damage to the developing ears while the baby is in the womb. Common causes of congenital hearing problems that are caused by damage during developing are excessive alcohol consumption, drug taking or smoking in the mother, or an infection, usually viral, that is passed from mother to baby. Infections that are known to lead to congenital deafness include German measles (rubella), herpes infections, cytomegalovirus infections and the sexually transmitted infection syphilis. Other ‘environmental’ causes include a difficult or premature birth, when the baby lacks oxygen during the birth process, an abnormality in the way that the head of the baby develops, or a problem between the blood type and rhesus status of the mother and the baby. Usually, when a child inherits a factor that causes either deafness or severe hearing impairment, that child has inherited two recessive genes that affect hearing. Normally, when a person has a dominant normal gene and a recessive faulty gene, their hearing is perfectly OK. It is only when two people like this have children, that there is a one in four chance that one of their children will inherit two copies of the recessive gene, and so be born with congenital hearing loss. There are fifteen genes that we currently know of that, when two recessive alleles are passed down, the child will either be deaf or partially deaf. Although congenital hearing problems are relatively rare, the screening process in hospitals in industrialised countries is quite rigorous. A newborn baby is tested for its response to sound before it leaves hospital, and regular hearing checks are then carried out by midwives and health visitors in the months that follow. It is important to pick up even a minor problem with hearing as soon as possible, as hearing impairment will prevent a child picking up language skills, and could delay speech, communication and educational development generally. Several genetic disorders are known to be associated with hearing problems including Usher’s syndrome, Down’s syndrome, Alport’s syndrome, Treacher Collins syndrome and Crouzon’s disease. Usher’s syndrome is responsible for about 5 per cent of the deafness that occurs in children in industrialised countries; there is no data for developing countries. About one in every 25 000 babies born has Usher’s syndrome, which is the result of a mutation in one of nine genes identified so far. Depending on which gene is faulty, the syndrome can be mild or severe. In the most severe cases, the child is born profoundly deaf in both ears and also suffers problems with balancing. Vision is also affected, and night vision is often a problem during early adolescence onwards. In the least severe, hearing is apparently normal at birth but deteriorates in the early teens. Night vision tends to decline at the same time and balance problems can also develop during early adulthood. Crouzon’s disease is due to a mutation in the genes that control development of the skull; the head does not form properly and the ears, and all the structures associated with hearing fail to develop normally. The ears tend to be lower on the head that usual, and the ear canal and inner ear structures are malformed. As with Usher’s syndrome, there are more severe and less severe cases, but many children born with Crouzon’s are severely hearing impaired from birth. There is currently no curative treatment for the genetic disorders that lead to congenital deafness but, in the future, doctors hope to develop gene therapy that might be able to remove some of the problems. It is unlikely, however, that hearing could be restored, as the damage is usually to the auditory nerves and the receptors that pass signals to the brain, and these cannot regenerate after birth.